Note: This audiobook was provided by the author via Barclay Publicity in exchange for an honest review. 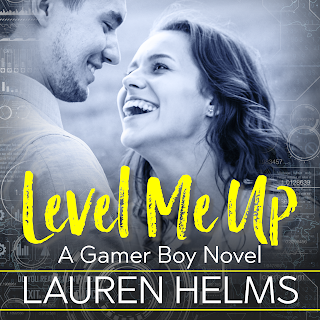 It's been a full twenty-four hours since I listened to Level Me Up because I wanted to take some time to gather my thoughts before writing this review. Let me say that it's never easy to type out on my keyboard how a book, regardless of its format, failed to click with me. Unfortunately, that's where I find myself with this first in Lauren Helms's Gamer Boy series. I've read and listened to quite a few romances wherein one or both of the main characters happen to be involved in the gaming world. Now, one doesn't have to be a gamer to have an appreciation for gaming as a whole or the individuals who immerse themselves in it. I'm not a gamer, but I get the fascination people have for it and why there are so many who get so into it. I even know a few of them personally. Learn more about Lauren Helms. Learn more about Lacey Gilleran. Purchase Level Me Up on Audible | iTunes.